“I remember you,” Asghar Farhadi says with a slight hesitation, trying to place me as he settled into a chair across from me. Indeed, two years earlier, we were in the same hotel discussing “A Separation,” the dizzying divorce drama that firmly established the former playwright as one of the world’s foremost filmmakers and led to the first Oscar for his home country of Iran. Not that he let any of that get to his head in the interim. Ironically, as much as Farhadi may have wanted to shield himself from the success of “A Separation,” it wasn’t as if he wasn’t considering the ramifications of lingering in moment for too long as he was moving ahead with a new project. 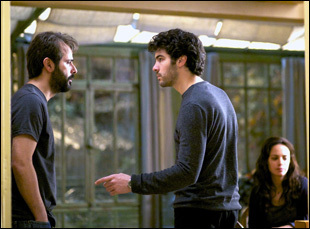 With “The Past,” the writer/director ruminates on three people afflicted with such a fate in Ahmad (Ali Mosaffa), his soon-to-be ex-wife Marie (Bérénice Bejo) and her new beau Samir (Tahar Rahim), who each have trouble cutting ties to their previous relationships even if it seems as though all it’ll take for a fresh start is Ahmad’s signature on the divorce papers. Of course, it can’t be that simple, especially once old wounds are reopened and the needs of Marie’s children as well as Samir’s are factored in, with the film’s crystalline structure giving way to a series of blunt, emotional gutpunches and though Farhadi approaches each scene as a writer with unflagging ferocity, his growing finesse behind the camera is what opens up the story to make a personal impression after digging in its heels as much as the characters do in their conflict. While in Los Angeles, Farhadi spoke about the process by which one of his films comes together, from its initial idea to how he blocks scenes, and whether he ever changes his mind about what happens to his characters after the end credits play. As was noted the last time we spoke, you usually start with a single image. Was there a specific one that this film grew out of? This time I began with a memory that a friend of mine had recounted to me. It was something he told me about six or seven years ago. He was going to travel to another country to formalize his divorce with his ex-wife. This remained with me without me believing that I was going to turn it into a film until one day in a meeting I suddenly recalled that and thought hmm, this would create such interesting drama. He was actually going to Canada, but when I wrote this, I switched it to France. What was it about France? Several different things. One of them is that the French know my films and I feel a sense of closeness to them. The other thing is that Paris is a city where the past and history are visible around you. Because my film was about the past, I felt that there was a link that got built there. Over these last few years, I’ve taken the greatest number of trips to France and when I get there, I no longer feel like I’m somewhere foreign. Was it a coincidence that a divorce is the film’s inciting incident, as in “A Separation”? I don’t think it’s a coincidence. Even though these two films are independent, in a way, they are in relation to each other like a pair of siblings, a sister and brother. If someone doesn’t see “A Separation” and sees the “The Past,” there’s no difficulty. But if they were to see both films, they would become aware there are some common themes. And it would allow them to better discover the buried layers. I’ve heard you say men are more burdened by the past than women. Why do you think that is? No, it’s a slightly more complex discussion. In literature, men are the sign of the past and tradition and women are the sign of change and the future, the reason [being] that women have the ability to give birth and to create the next generation. This is more of a symbolic thing. We may find men who may think much more than women do about the past. But in a general way, in my film, it’s been such that the men are much more attached to the past than the women are. You usually place a great deal of emphasis on catching expressions to begin with, but since you were working with a cast in a language other than your own, did that make your focus on that even more intense? I think it was stronger. Here, I was concentrating much more closely on their eyes, their face, on their physical gestures and on their features because here I was working with a language I wasn’t familiar with, so I was replacing it with some other things. Is that a feeling the audience you wanted to share in? There are a few scenes in the film where you witness conversations without hearing them taking place behind a window or a pane of glass. That wasn’t really my intention with those scenes with the glass, which actually could pass unnoticed as a very ordinary day-to-day event in watching the film. Its meaning for me was to put into pictures the way these people were unable to communicate with one another. Do you actually know the blocking of scenes during the writing process? That most often happens on set. With regards to some of the scenes when writing, I know the position of the characters and the mise en scene. But then later when I go on set, the details such as the precise position of a character become clearer. Do you actually start with characters first or the conflict? I’ve heard it’s often the former. No, it’s actually the complete opposite. At the outset, I have a story. In the story, there is a point of tumult or conflict. What I do then is place characters within this conflict situation. That is to say I first find the crisis and then I inhabit it with characters because what I believe is it’s the situation that affects the characters less than the characters influence the situation. Every time I’ve seen you introduce one of your films at a festival, you like to say you’re looking forward to the Q & A afterwards not so that you can give answers, but so you hear the questions. Is there something you’ve learned from them? I’ve learned a great deal, the first of which is how similar their feelings are to one another and to my own feelings. The fear in the face of someone from somewhere far and foreign no longer applies to me. I feel like I could grow very close to a person anywhere in the world. You do always leave audiences to come to their own conclusions. Because you often leave your endings open to interpretation, does your own mind ever change about the meaning as the years go on? “The Past” is now open in Los Angeles at the Royal and in New York at Film Forum and the Lincoln Plaza Cinemas before expanding on January 10th. A full list of theaters can be found here. Favorite Talks of '13: Michael Mann on Going Back to Chicago for "Thief"